A Flood Risk Assessment giving consideration to the existing and proposed levels of the site, detailing the route of any flood water, by examining the immediate and surrounding topography and geology and assessing whether the building and residents would be safe in a flood event, detailing mitigating measures where necessary. A preliminary design providing detail on the potential storm water and foul water drainage options and justification for the selected system, outlining ball park costs of construction and installation. Including preliminary construction details, preliminary network design in plan drawing format and the hydraulic calculations needed to size the systems. The site was bordered by steeply sloping hills on three sides with a road to the North. Storm water would therefore be naturally funnelled down to the property and any SuDS solution proposed would have to cater for this. The SuDS solution needed to ensure that the water leaving the developed site would be no greater than that prior to the proposed development. The site layout and surface water drainage systems needed to be able to cope with events that exceed the design capacity of the system, so that excess water could be safely stored on or conveyed from the site without adverse impacts. Also known as the examination of ‘flood flow routes’. 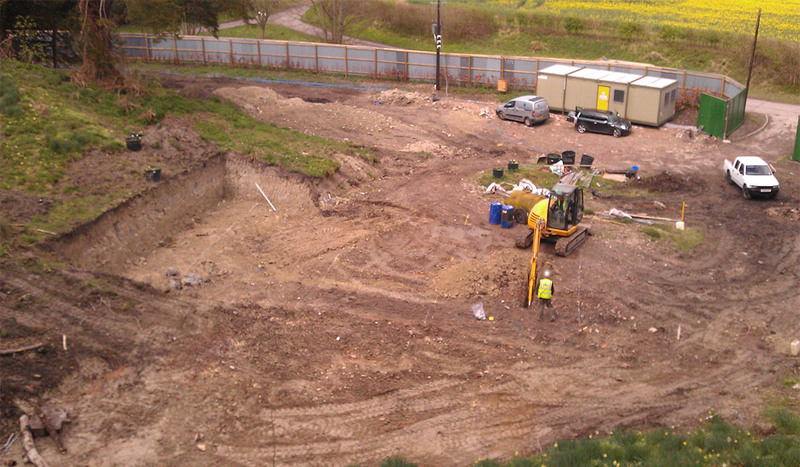 The site had a water well on-site and the client wanted to look at the feasibility of utilising this to dispose of stormwater. A permeability test done by out parent company Geo-Environmental Services limited had indicated a poor infiltration rate and this would have an impact on the solution required as a larger design capacity would be required than initially thought. Finally trees and other vegetation had recently been removed from the surrounding steep slopes. As a result, the rate of rain water run-off from these slopes is likely to increase. Furthermore there is a high risk of soil erosion and the accumulation of soil at the foot of the slope could affect flood flow routes. In order to reduce the potential run-off from the slopes onto the landscape area, it was proposed that land drainage (otherwise known as French drains) should be laid along the foot of the steep slope, to capture slope run-off and channel it to the existing ponding area at the lower end of the site. The land drainage design needed to account for the potential increased sediment load from the bank soil erosion. A protective fleece was recommended to help prevent the ingress of sediment into the land drain. Slope stability geotextiles were recommended as an interim measure whilst the vegetation layers reformed. The water well was found to be unsuitable as a storm water drain and was recommended to be capped off. Whilst a wide range of SuDS solutions were investigated and graded for their ecology potential, amenity potential, water quality treatment: maintenance cost implication and land uptake, the most favourable solution was found to utilise attenuation crates on the site. We had been able to help our client understand how they would meet the planning conditions on the site – the Flood Risk Assessment that we supplied in our report satisfied the planning approval process. Our report provided the client with a fully sized and costed SuDS system for handling storm water and a system for handling the foul water, as well as detailing where those systems would be situated on the site.As an additional benefit we had identified a potential issue with the clearance of vegetation on the slopes and suggested measures that would mitigate any potential flood issue from that source.